Fort Augustus, at the heart of the Great Glen, is a hive of activity - bustling with boaters, locals and visitors. Take time out here to enjoy the Caledonian Canal Visitor Centre. A small but unique venue showcasing the history of the Caledonian Canal from its beginnings to its present day refurbishment. 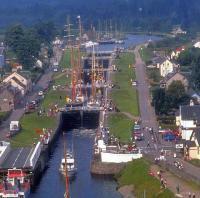 The Fort Augustus flight of locks is worth exploring even if only for the fascination of watching the boats come and go. The canalside walk to Kytra Lock, delightfully set among the hills, shows you how the Canal ousted the River Oich from its original channel. There are several other good walks through the nearby woodlands and around the village. During the summer months, you can get details of all the walks from the Caledonian Canal Visitor Centre. Approximately 1 hour's drive on the A82 from either Fort William or Inverness, the Visitor Centre is adjacent to the flight of locks at the centre of Fort Augustus village. Car parking in main village car park.